From November 6-16, 2013, I appeared in the Zurich Comedy Club‘s production of Don’t Dress for Dinner—a deliciously funny comedy by Marc Camoletti. In the show, I played a cordon bleu cook named Suzette. To prepare for the role, I decided to cook all of the meals Suzette is supposed to be able to cook. These were: Artichokes in sauce velouté, Cheese soufflé, Veal a la crème, and Raspberry pavlova. [All of these are eaten offstage during the intermission.] I’m not a cordon bleu cook. However, I thought it would be a fun challenge anyway. I posted these recipes throughout the run of the show. The first course in the play is Artichokes in sauce velouté. I love artichokes. 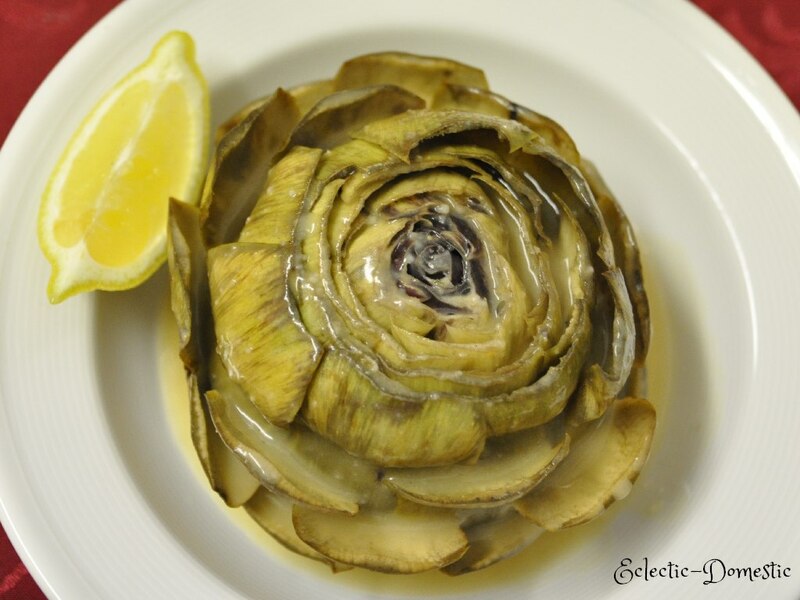 Ordinarily, I eat artichokes with lemon butter, which is a very delicious combination. They are available year round but are best in spring and fall. The question of how to prepare and/or eat an artichoke often prevents people from trying this delicious vegetable. But it’s really very easy once you know how to do it. I have included instructions below the recipe. Sauce velouté is one of five “mother” sauces that were codified by Auguste Escoffier in the 19th century. (The others are: tomato, Hollandaise, Béchamel, and Espagnole.) These sauces are the bases of all of the other sauces in classic French cooking. The sauces derived from them by adding flavoring ingredients are called “daughter” sauces. The term velouté comes from the French adjectival form of velour, meaning velvet. Sauce velouté is basically a roux made with 1 part butter and 1 part flour, then a light stock is added and salt and pepper for seasoning. The sauce is commonly referred to by the type of stock used, e.g., chicken velouté. The following recipes are not necessarily ones I have developed myself, but they are slightly adapted as I prepared them. Cut off the top tips of the artichoke (about 1.5 cm or 1/2 inch) using a sharp knife. Snip off the tips of the remaining outer leaves using kitchen scissors. Pull off any bottom leaves that are brown or streaked. 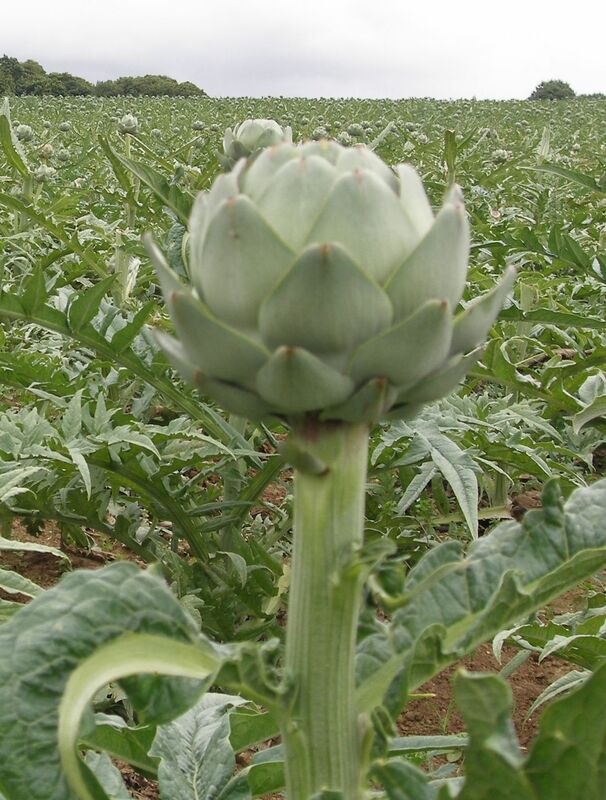 The stem of the artichoke is edible. When I lived in the US, it was one of my favorite parts. However, here in Switzerland, the stems of the artichokes I can get are really too tough to eat. So, depending on your preference, either peel off the tough, stringy outer layers of the stem with a vegetable peeler or cut off the entire stem. Dunk and soak your artichoke(s) upside down in a pot with water with a tablespoon or so of apple cider vinegar for about 10 minutes. (By the way, I recommend doing this with all vegetables. Apple cider vinegar is an excellent cleaner.) Cook immediately or keep in acidulated water (water with some lemon juice, lime juice, or vinegar) to prevent browning. In a large pot, put about 2 cups of water, a clove of garlic, lemon slices, and some salt. Insert a steamer basket (or float in more water if you don't have one). Add the artichokes upside down. Cover. Bring to a boil and reduce heat to simmer. Cook for 25 to 45 minutes or until the outer leaves can be pulled off easily. Cooking time depends on the size of the artichoke—the larger it is, the longer it takes to cook. Artichokes can also be cooked in a pressure cooker—about 7-12 minutes cooking time from the time high pressure is reached. Use the quick release method to release pressure, then the open lid carefully to test for doneness (the outer leaves can be pulled off easily). In a saucepan, over medium heat, melt the butter. Whisk in the stock, 1/3 cup at a time, until smooth. Bring the liquid to a boil and reduce the heat to low and cook for 15 minutes. Remove from the heat and serve on the side in a dipping bowl or pour over the artichoke. If your artichokes are too large to fit together whole in your pot, you may also halve or quarter them. Adjust the cooking time accordingly. Pull off the outer leaves one by one with your fingers. If a dipping sauce is provided, you can dunk the base of the leaf into the sauce. Then, holding the tip of the leaf bite down on the leaf with the fleshy part facing down, and pull. You will scrape off a mouthful of deliciousness with your teeth. Repeat until all the outer leaves have been removed. After that, you’ll find a cone of purplish, lighter green inner leaves, which you can twist off all together. Dunk and bite lightly. There is still a good bit of meat on them, but they are usually too soft to scrape in the same way. Under that, there is a mat of thistly spikes called the choke. These are usually too tough to eat. Scrape them off with a spoon or your knife and set aside. And finally you get to a rounded bottom, which is the heart. This is the best part. Cut, dunk, and savor. Here’s a good video that shows what I mean. Yum! I grew up eating artichokes. My mother used to stuff them, Italian style. I’ll have to try them with this sauce! Thanks! I like the history part of this post, the background is interesting and the tip about using apple cider vinegar as a cleaner is a good one. I must remember to do that. I might need to wait until artichoke season here (the spring!) to try these. It’s all about hard shelled squash and apples where we live now. I absolutely agree that it is ecologically and nutritionally sound to buy locally sourced in-season foods. Thanks for pointing that out, Heidi. Normally, I do that. However, this post was part of an experiment for the play. I’ve also been making artichokes mostly with lemon and butter. Adding the “optional” garlic and lemon to this sauce sounds like these are de rigeur, or should be, to perk up the slightly bland ingredient mix of the classic. Great insight.